You are in for a treat today. I was fortunate to get an interview with Luke Flesher, the Store Manager from Australia's first plastic free grocery store aptly named No Plastic Fruit and Vegetables located in Queenscliff, NSW. While the store has not been open long I feel that it has laid important foundations of what will one day be a shift in how the people of Australia shop. What makes the store unique is that its goal is to actively encourage shoppers to understand plastic is not necessary. 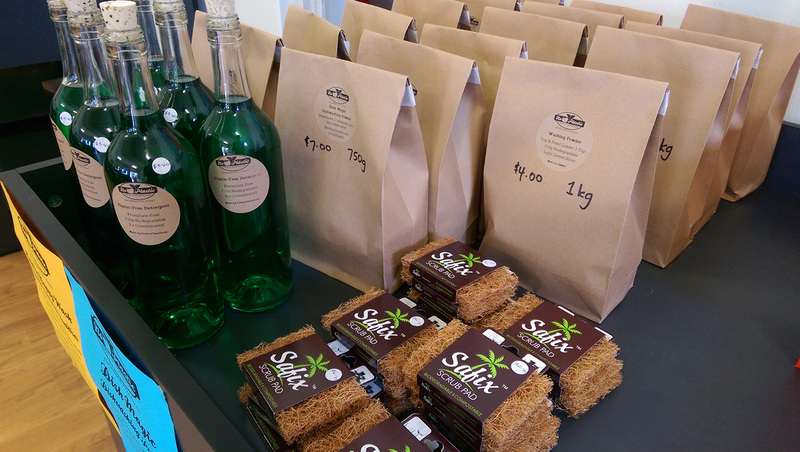 While there are a growing number of bulk food stores that plastic free shoppers frequent this is the FIRST one I have come across that has chosen to focus specifically on minimising plastic. They are a small store with great big heart and I look forward to watching them grow. Congratulations on being the first grocery store in Australia that is plastic free. 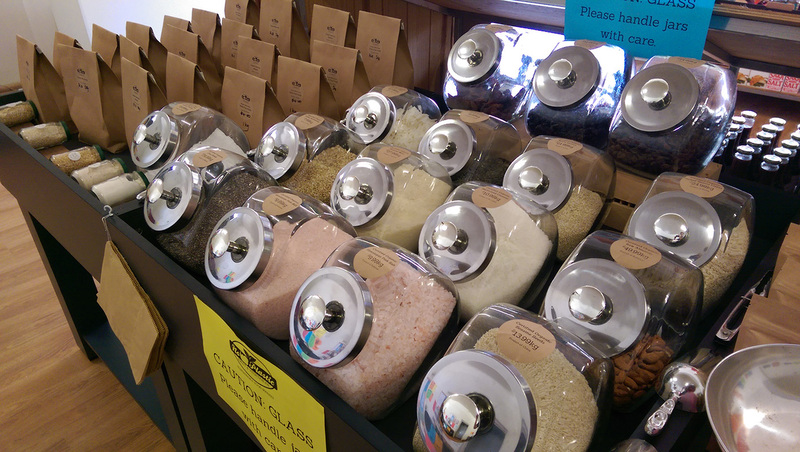 What made you want to open a grocery store devoted to plastic free living? Thank you! The store is owner Alex Grant's brainchild. He is a Sydney Northern Beaches local, keen swimmer and passionate plastic hater. He sees this store as his way of taking a stand against the amount of plastic in the world, particularly in our food supply chain. And to maximise the impact he could have, what better way than starting a dedicated store, enabling others to reduce their own plastic use at the same time? He wanted to show people that it is possible, and there are alternatives to what many think are the only grocery shopping options out there. As Store Manager, it's my job to spread the word far and wide, provide great customer service to ensure positive word of mouth, and keep finding new products that fit our criteria of no plastic in the products themselves, or their packaging. Even your store itself has minimal plastic, was this easy? In most ways, absolutely. We chose wooden and metal display racks, and particle board free standing units. We don't have any of those plastic price tag holders you see on supermarket shelves, nor any laminated signage, stickers or price tags - instead we use paper, blu-tak and masking tape. Our bread is displayed in a second hand wooden bookcase, our newspapers on a recycled wooden crate, and our coffee machine sits on a second hand wooden table. We have metal shopping baskets instead of plastic. The concessions we had to make plastic-wise for our shop fittings were the till itself (sadly old-school metal tills don't quite have the functionality for what we need), the EFTPOS machine, and an air conditioning unit. Were you living plastic free previously? I come from South Australia, who have had a couple of excellent initiatives in place for a number of years - a ban on grey plastic bags at supermarkets (an imperfect solution but an admirable step in the right direction), and a drink container deposit scheme - both of which make plastic reduction a lot easier. I wouldn't by any means say I lived 100% plastic free, and I don't think Alex would either; although he certainly avoids plastic like the plague, it's an unfortunate reality that it has traditionally been very difficult indeed to completely eliminate it from every day life. 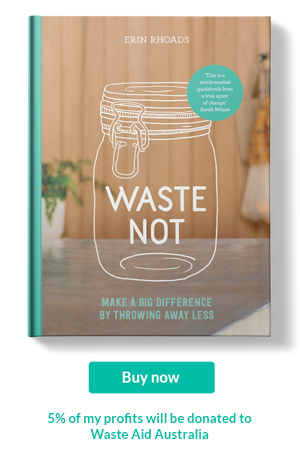 Since starting this business though, you can't help but look at your own plastic use, and, when you start to think about alternatives and see through research and hard work that there are legitimate alternatives, find ways to dramatically reduce your own use. Sites like your own are a tremendous resource for helping people, and we do commend you for the time you spend spreading the word! And we're pretty realistic - it still remains very practically difficult for most people to live plastic free. No one is perfect, and I myself still make mistakes on occasion. But that realisation you've made a poor purchasing choice in itself is useful...as long as you act on that realisation and change. That's something everyone can do, and this is something I always stress: make small but meaningful changes to their everyday habits. And that can definitely start with your grocery shopping. Our store is by no means a panacea for a global problem, but it provides a viable alternative and, hopefully, gets people thinking a bit more deeply. 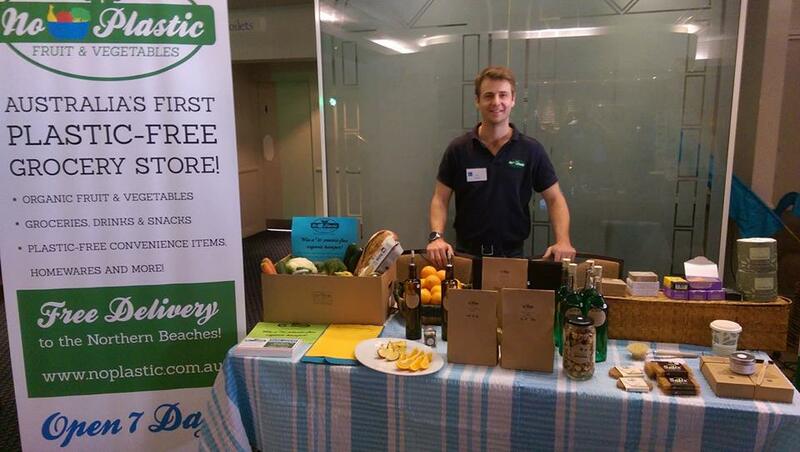 Luke with a selection of the store's plastic-free offerings on a trade table at a local festival recently. What common misconceptions about living plastic free have you come across? That throwing something away means it's gone. It doesn't disappear - it goes into landfill. Or worse. That releasing balloons at a party is a good idea. It's not. They get blown into the ocean. That kids don't understand simple conservation messages like "take a bag to the supermarket instead of grabbing a plastic one". They do, and educating at a young age is the best possible way to instill behaviour for life. What was the moment or event that made you want to live plastic free? For Alex, I'm sure it was swimming or snorkelling at a local beach and being overwhelmed with sadness at the amount of rubbish on the sand and in the water. For us here in the store, it's receiving the messages of support from customers and people on social media - it tells us that, despite the many challenges in running a small business like this an industry of true giants, what we're trying to do is touching a lot of people. That certainly does make it worthwhile. What are the biggest challenges you have overcome? Finding suitable products would be the number one challenge, certainly. It's often a case of "right product, wrong packaging" - there are countless great products that could be a great fit for our store, but plastic in one form or another gets in the way. And we don't budge on that - right down to a plastic label on a glass drink bottle instead of a paper one. But on the flip side, we have met many suppliers, particularly smaller ones, who are willing to work with us. For example, our most popular product is locally made Bobby Muesli, which normally comes in a plasticised pouch. But we worked together, and for us, Kristi from Bobby packages it in glass jars with paper sticker labels. We've also managed to reduce the plastic coming into our store; for example our regular bread delivery at first came on a tray wrapped in a large plastic sheet. We said we didn't want that, so the very next day it came simply covered in paper instead, and it has ever since. I think that says something about what is possible if you ask the right question, too. It's always a great sense of achievement when we find our own solutions, too. Buying bulk, eco-friendly dishwashing detergent and repackaging it in glass bottles with cork stoppers and paper sticker labels is a nice feeling. Even though, yes, the initial 20L container is plastic, we're saving 30-40 single use plastic detergent bottles and lids, plus giving people the chance to refill their own bottles, and we send the containers back to the manufacturer to reuse. That is a great result by any standard of measurement. As a small business, the obvious other one is creating awareness to convince people to change their habits away from shopping with the big guys. There's a nice bus shelter campaign in Sydney at the moment encouraging people to shop local and support local businesses, which is great to see. Social media is also great for bringing in like-minded people, and we never pass up opportunities to speak to people like yourself who are so obviously on the same wavelength! As I said, we've been really encouraged by the responses we've had to our concept. We're still very much in our infancy and there's lots of work still to be done to establish ourselves in our current location. We want to keep adding new products to the store, keep spreading the word, and keep improving our own processes to ensure we adhere to our own principles as best as possible. It's too early to talk about expansion or other stores, but I think the concept certainly has potential, particularly as the overall movement grows and more and more people start to change their ways. What is your number one tip for reducing plastic? Other than shopping with us? ;) But seriously, supporting people trying to make a difference is probably one of the best things you can do. Spending $30 or $40 in a store like ours makes a real difference to us, whereas it's just one more micro-transaction for the big guys. Take the time, where you can, to educate yourself on alternatives. Buy a solid shampoo bar instead of one that is 90% water AND comes in a plastic bottle. It's a better product AND it uses no plastic! And ask for NO LID on your take away coffee...better still, bring your own cup! Inspired much? I know I am. If you are too let your friends know about this store and feel free to share this interview. And don't forget to support your local businesses.